Road America is a proper old-school race track and one of the best road courses in the USA. Like any great track worth it’s salt, it also has some legendary corners, such as the plunging downhill carousel turn which leads into the fast, right-handed Turn 11 - better known as the kink. As well as being incredibly fast, it also has very little run-off and just a concrete barrier on the exit, making it a place where you really don’t want to have an incident. 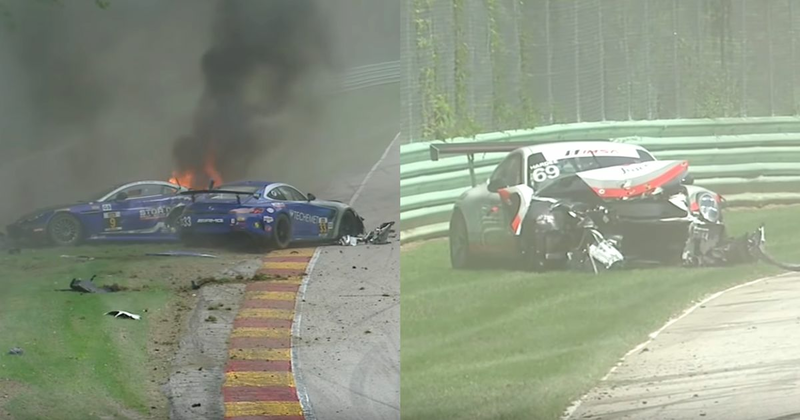 In the GT3 Cup Challenge, Dan Hardee ran onto the grass on the exit of the corner, bounced off the inside wall and back onto the circuit. In trying to avoid him, Scott Welham clipped the grass further down the straight and spun, having his own sizeable accident. The corner claimed two more victims in the WeatherTech SportsCar Championship. First, Francesco Piovanetti bounced across the dry grass and spun, fortunately only grazing the barriers. Then, later in the race, Patrick Lindsay understeered off and brushed the outside barriers. The biggest crash, however, happened during the Continental Tire SportsCar Challenge race. Craig Lyons was being passed by another car on the way into the corner, but turned in too early and mad contact, spinning him backwards into the wall and being launched into a series of rolls. In the dust and the confusion, the car of Russell Ward also went off, colliding with the Aston Martin and causing the pair to dramatically erupt into flames. Craig Lyons was sent to a local hospital as a precaution but amazingly, everybody involved in this - and all of the other incidents - was OK.